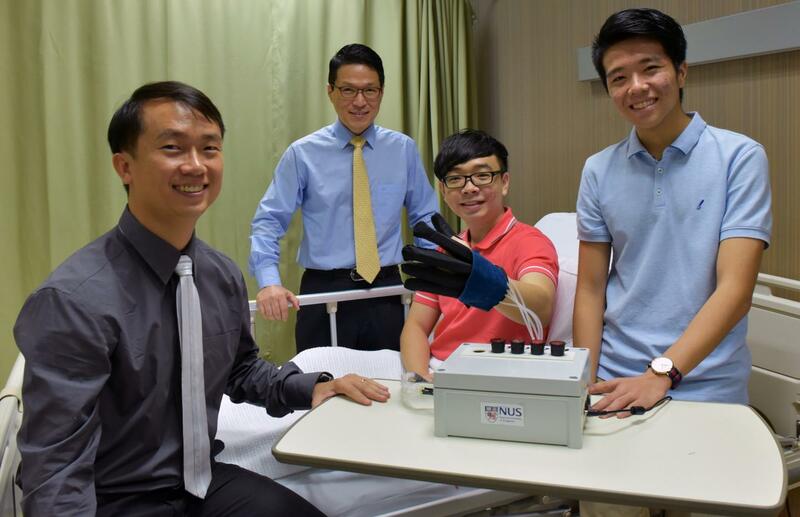 Patients who have lost their hand functions due to injuries or nerve-related conditions, such as stroke and muscular dystrophy, now have a chance of restoring their hand movements by using a new lightweight and smart rehabilitation device called EsoGlove developed by a research team from the National University of Singapore (NUS). Made of soft materials, this novel device is an improvement from conventional robotic hand rehabilitation devices as it has sensors to detect muscle signals and conforms to the natural movements of the human hand, reducing discomfort and risk of injury. This robotic glove is also compact and portable, so patients who are recovering at home or are bedridden could carry out rehabilitation exercises with greater ease and comfort. Assistant Professor Raye Yeow from the NUS Department of Biomedical Engineering, who specialises in soft wearable robotics and is a key member of the research team, explained, "For patients to restore their hand functions, they need to go through rehabilitation programmes that involve repetitive tasks such as gripping and releasing objects. These exercises are often labour intensive and are confined to clinical settings. EsoGlove is designed to enable patients to carry out rehabilitation exercises in various settings – in the hospital wards, rehabilitation centres and even at home. Equipped with technology that can detect and interpret muscle signals, EsoGlove can also assist patients in daily activities, for instance by guiding the fingers to perform tasks such as holding a cup."